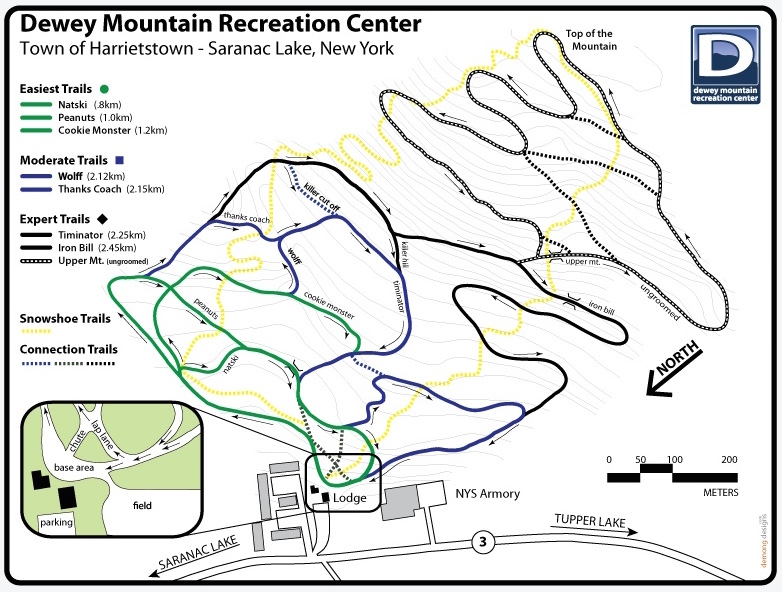 Dewey Mountain is a municipal trail system owned by the town of Harrietstown NY. Among others, Olympic nordic combined gold medalist Bill Demong and Olympic biathlete Tim Burke cut their teeth here as juniors. On the map above, the blue colored trails are ungroomed: they’re somewhat narrower and rougher than the groomed trails closer to the lodge. The current lodge is a small building in need of replacement. There’s a fundraising campaign to raise money to build a modern, energy efficient lodge. Bill Demong has speaks passionately about coming up at Dewey Mountain as a junior.